Chunmee Tea (eyebrow tea) gets its name from the curve of the processed leaf. It was thought, when viewing the beautifully shaped leaf, that it resembled that of a woman's finely formed eyebrow -- as opposed to an older man's bristly brow. Great skill is required to produce this very high-quality green tea. The fine eyebrow-shaped leaves produce a clear, yellow-greenish brew with a distinctive sweet, plum-like flavor. Gunpowder Tea is Chinese green tea named for the way the tea leaves are rolled into small pellets, which look like old-fashioned gunpowder. Rolling the tea leaves helps preserve its freshing flavor, produce an aromatic, light liquor which opens with a crisp astringency and develops into a well-rounded sweetness with a lingering, mellow finish. This product is made from the fresh and quality wild tea growing 1000M above the sea level in organic tea garden. With the guidance from the senior tea technical staffs, this product is a kind of tea by manual work with no pollution, no poison on it. It has tight, curly and tippy shape .Its dried tea color takes on green jade and bloom. It has heavy and strong fragrance and fresh, sweet and mellow taste. The tea residue takes on tender green and bright. This product is a superior one in tea. This tea was processed very simply. It reserve whole of nutrients in the fresh tea leaves. So it was called the real tea.However the shape of original tea isn't very beautiful as the simply processing. But the nutrition is best and with competitive price. The bud tea is a full-flavored green tea. It grows in organical tea garden, was picked one bud and two tiny leaves in early spring and hand-processed according to ancient methods. It’s a full-leaf tea, not dust, offering rich tea. It can’t be boiled and drunk many times. It’s the freshest and highest quality loose leaf tea. This special type of black tea from the Fujian province of China comes this very distinctive tea with its exotic smoky flavor. After plucking, the leaves are withered over cypress or pine wood fires. After the rolling process, they are placed into wooden barrels until they begin to emit their own pleasant aroma. As a final step they are placed in bamboo baskets and hung on racks over smoky pine fires where they dry and absorb the essence of the smoke. Gongfu black tea is a traditional product of China, especially famous for its delicacy in shape, color, fragrance and flavor. Main tea provinces: Anhui, Yunnan, Fujian, Hubei, Hunan, Shichuan, etc. White tea from China. Silver Needle is among the most revered of Chinese teas, produced in the Fuding and Zhenhe districts of its Fujian province. Gathered only in the few days of early spring, the preparation of this tea is governed by strict requirements to ensure a premium product. This dedication to perfection is evident in the cup, which is sweet and delicate with a clean, airy fragrance. 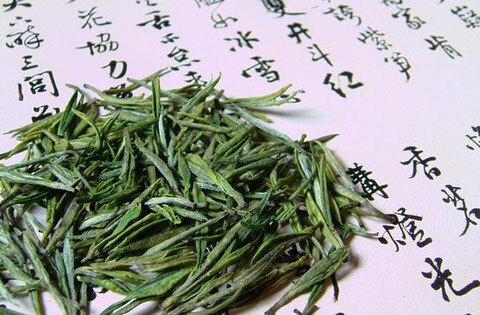 Our 'Sublime Needle' is a Special Grade (Bai Hao) version of this exquisite tea. Yellow Tea is a non-fermented or non-oxidized tea. It is very similar to Green Teas except with an additional step that results in the finished tea leaves having a natural light yellow color. Golden Needles also known as Jin Yin Zhen consists of only singular young tender buds hand picked before they open and mature. During the imperial period in China, Yellow tea was highly prized for this slight yellow tea leaf color, the color of royalty. Huoshan Yellow bud was already well-known as a famous tea in Tang dynasty. While the production skill of Huoshan yellow bud has ever been lost in the hundreds years before 1971. Huoshan yellow bud is mainly produced in the Huoshan area of Anhui province. The tea leave looks like the tongue of sparrow. The tea is fine and tender, covered by hairy tip. Because of a special processing step named "yellowing", the tea leave show yellow in color. The cup color of Huoshan yellow bud is olivine. It smells fresh and refreshing, somewhat with chestnut fragrance. The taste is mellow and thick. The tealeaves after infusion are tenderly yellow. The name Huangya means "Yellow Sprout." ? The beautiful leaves are a mixture of jade green, yellow and white colors. ? 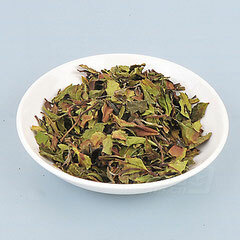 Single small leaves with hairy tips create this nutty and smooth Tea with a gentle, sweet finish. Pu-Erh Tea is one of the ten most famous teas in China. Pu’Er is a large leafed tea from the Yunnan province in China and has been famous as a medicinal tea. The earliest records of Pu’Er tea date back to the Tang Dynasty ( 618AD-906AD ) when it was the favorite tea of the nobleman of this time. 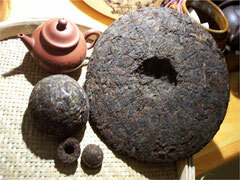 Pu’er tea over the centuries has been used as a form of currency in China and an important international trading item. Pu’re tea was at one time very well known in northern Canada among the northern native people, who were trading across the Bering Strait. Pu’Er tea derives its name from the market town of Pu-er, where it was originally processed and sold, but it is grown on the Nuoshan Mountains. It is said that the unique taste of? Pu’Er Tea was developed because it took weeks to transport the tea leaves by horseback to the town to be processed. During this transportation period the tea leaves would begin to ferment in the humidity and release a strong, fragrant aroma, which people found quite pleasant. A special technique of tea fermenting developed and Pu’er was thus created. The secret of making Pu’er tea has been closely guarded in China for centuries. The tea leaves are collected from growers of a special broad-leaf tea tree, which are said to be related to ancient prehistoric tea trees. The leaves go through two types of fermentation, which gives this tea its unique characteristics; a mild, but distinctively earthy flavour. 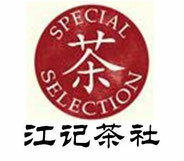 Pu’er requires a minimum of 10 years to mature and gets only better with age. Pu’er teas are much like fine wines, which become smoother and more balanced with age. Pu’Er teas are much lower in tannins than other teas due to the special processing method which it undergoes. 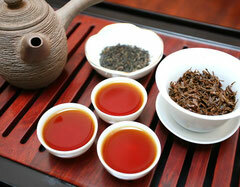 There are pu'er loose leaves tea, cake tea, brick tea, bird's nest' tea, arts and crafts pu'er tea. Yin's flavor. Right or wrong, Ti Kuan Yin's unique flavored is named as "Kuan Yin flavor". Also, Ti Kuan Yin tea wins the reputation fo " lingering fragrance remain after seven times infusions". Rou Gui is the latest tea added to Wu Yi’s famous five bushes (previously only four consisting of Tie Luo Han, Shui Jin Gui, Da Hong Pao and Bai Ji Guan; referred to as Si Da Ming Cong). All these teas originate from Mount Wuyi in Northern Fujian of China. This tea leaves is picked with special care by only choosing the best leaves. Phoenix single bush come from GuangDong Cao'an district's Phoenix Mountains.The outstanding single bush with idiosyncracy in the Phoenix Narcissus variety colony is selected and plucked to produce Phoenix single bush. According to the various nuances in taste and fragrance, Phoenix single bush can be further categorized into more than 80 varieties, such as "Huang Zhi Xiang","Rou Gui Xiang", "Xing Ren Xiang" etc. Long,twisted leaves show with yellow auburn color. When infused, the gentle natural floral aroma and mellow, brisk taste will farthest satisfy your palate and nose. 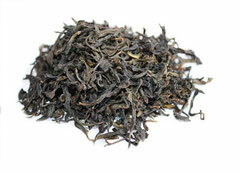 Phoenix single bush is definitely differentiated from other Single bush Oolongs by its special "mountain rhythm". The liquor of the cup is clear like tea oil.The tealeaves after infusion are green with red edge. Taiwan Ali Mountain Oolong Tea grows at Ali Mountain , 1300 of elevation. In the thick fog surrounds perennially, the temperature is low, the tea produced draws on day. Moon. Quintessence revealed. So its fragrant smell is original and special, fragrance overflows in the entry sweetly and fragrantly, for its special point. 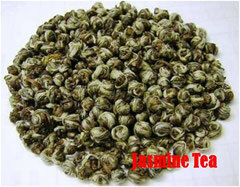 Jasmine Tea is one of the ten most famous teas in China. Jasmine Tea is a famous tea made from Green or Pouchong (Chinese Green) tea leaves that are scented with jasmine flowers. The jasmine flowers are harvested during the day and stored in a cool place until night. During the night, the flowers bloom with full fragrance. The flowers are layered over the tea leaves during the scenting process. The quality of Jasmine tea is determined by the quality of green tea used as its base and the effectiveness of the scenting.